With its almost bezel-free screen, in-display fingerprint scanner and pop-up selfie camera the Vivo Nex is one of the most interesting phones of the year, and while so far it’s only launched in China, there’s now reason to think you might be able to buy it one day soon. That’s because Vivo has just announced plans to bring the Nex to India as well as Russia, Malaysia, Hong Kong and Taiwan by the end of this month. There's no word on pricing details just yet. There's also no word on a launch for countries like the US, UK or Australia, but this may show an intention to bring it to other markets around the world soon. That said, we wouldn’t count on it, as right now Vivo doesn’t have much of a presence in any of those regions, but the Nex would be a good handset to change that with, since it’s one of the first phones to include the features listed above. If Vivo does launch the Nex in the west it could get a head start on the likes of the Samsung Galaxy S10, which will quite possibly have an in-display scanner of its own, and while the whole industry is seemingly moving towards bezel-free screens, no company has come as close as Vivo, other than Oppo with the Oppo Find X. 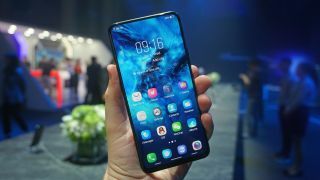 With the Vivo Nex also sporting a 6.59-inch Full HD+ Super AMOLED display, a dual-lens rear camera, a Snapdragon 845 chipset and 8GB of RAM there’s plenty of reason to hope it does become more widely available, and with today’s news it seems at least slightly possible that it might, but don’t hold your breath.